by Frank Pollaro like, and put any style of border on it. I've chosen a 45* crossbandcd border for this board, but you can make a simpler border if you like. For chessboards, I suggest woods with strong contrast, such as the macassar ebony and curly maple on this one. I use 3/4-in.-thick MDF for my veneer oc 1 OB ^ R 1 99a substrate, gluing a secondary veneer to its back for stability. MDF also makes a good straightedge for sawing the veneer pieces. To mate well, veneer edges must be straight and square. But because my veneer saw's teeth are beveled on one side, only the stock under the straightedge will be cut square. To cut a strip that's square on both edges, first trim one edge of the veneer stock square using the straightedge. Mark the width of the strip, then turn the stock around so the finished piece is under your straightedge. Before you cut the strip free, prop the "free" end of the straightedge on another piece of veneer, as shown in the top photo. Repeat this for every strip, marking widths with a sharp pencil or knife. Stack the cut strips in sequence to maintain grain continuity on the finished board. Then join alternating color strips with moistened veneer tape. Always apply the tape to the "show" side of the veneer. It will be sanded off later. Beginning at one end of two adjacent strips, pull them together. Tape across the seam every few inches, and press it down with a roller. Then tape the entire seam as shown in the middle photo, again pressing the tape with the roller. Make checkered strips of alternating colors by crosscutting the striped field. (See bottom left photo.) Mark your first cut by laying one leg of a framing square on a taped scam and tracing along the opposite leg. This will ensure that all your subsequent strips arc cut square. Now create the checkered field pattern by taping the checkered strips together. Offset every other strip by one square, as shown in the bottom right photo. When all of the strips arc taped together, carefully trim off the excess squares using your straightedge. This border is pieced together from 45" diagonal slices cut from veneer stock that you've trimmed to a consistent width. I.eave the stock as wide as possible to yield slices long enough to span half the width of the finished chess-board. If your stock isn't very wide, you can always tape the diagonal slices together to make longer pieces. Guide a >harp veneer saw against a 3/4-in.-thick MDF straightedge S* to cut the strips. To make strips of alternating squares, crosscut the striped pattern. Offset every other strip by one square to create the checkered pattern. crossband border pieces from veneer stock trimmed to consistent width. Add the banding. Attach banding to the joined border pieces with short lengths of tape. Fit the border. Miter the four border pieces where they meet at the corners of the boards. 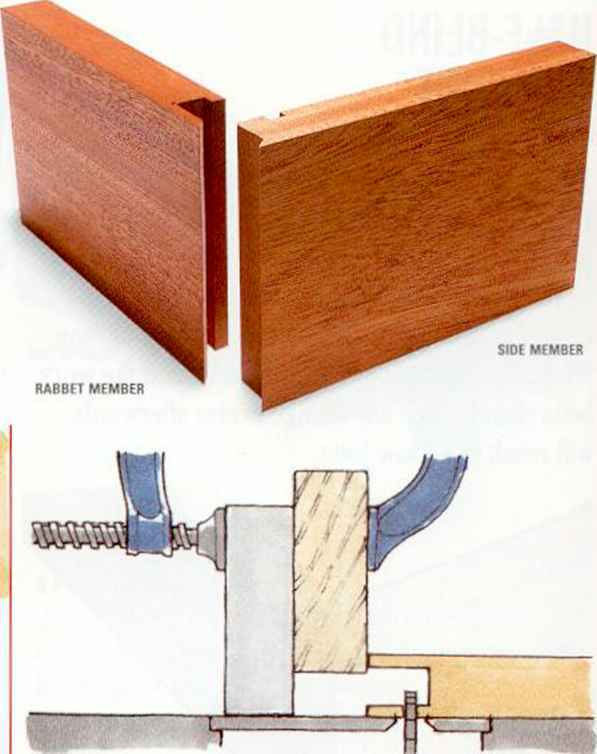 straightedge, aligning one edge of the veneer with the edge of the straightedge, as shown in the top left photo. I mark the first 45* angle using a combination square, then I saw the cut using my straightedge. Next, I carefully measure over for the next cut (2V*j in. for this board) and repeat for subsequent cuts. STEP 1: File the teeth. Hold a triangular mill file square to the face of the blade, but cocked clockwise a few degrees to maintain tooth rake. Push forward with the same number of firm, even strokes in each tooth gullet. There's no need to saw the opposite edge of each piece square as you did before, because it will be trimmed on the table-saw later. Keep the pieces in sequence as they come off the stock to keep track of the square-sawn edges. STEP 2: File the bevel. Extend the teeth over the edge of a bench. 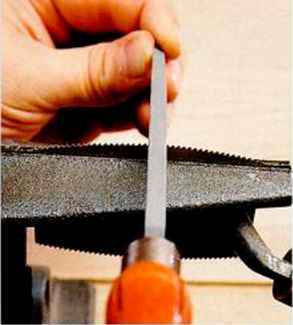 Sweep a mill file diagonally at a low angle across the saw's edge to create a bevel. STEP 3: Hone the back of the blade. 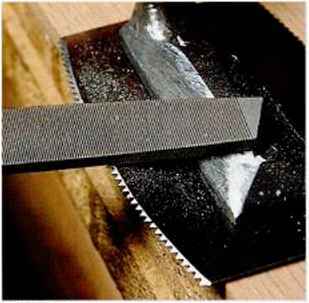 Remove filing burrs by honing the back of the blade on a sharpening stone. I use an 800-grit waterstone. perimeter of the field. Flip pieces end for end as necessary to create the mirrored diagonal pattern shown in the lead photo. If you need to lengthen the halves to create one half of a border, tape end to end as many pieces as needed. Allow excess length that can be trimmed to fit later.